Armchair Audies Wrap Up (And the Winner Is… – my books. my life. After watching from the sidelines last year, I decided to participate in the Armchair Audies this year. Basically, participants listen to a category of Audie (the award for audiobooks) nominees and decide which one should win. I joined Trish and Melanie as judges for the Solo Narration – Male category. To me, Beautiful Ruins is by far the winner here. 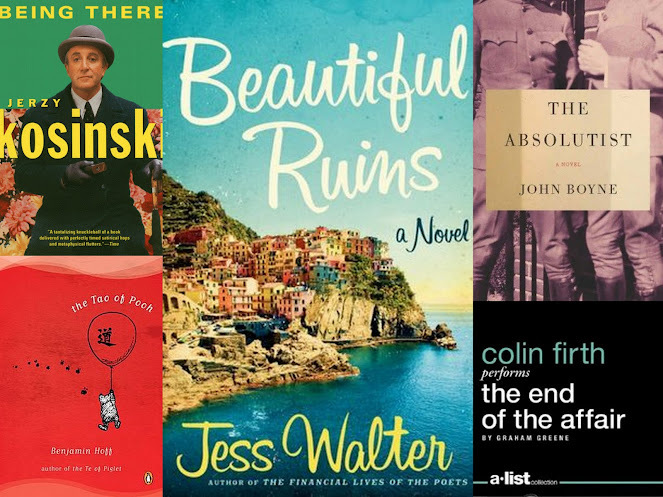 I’ve brought you the reviews for all of the nominees except The End of the Affair (one sentence review: this was my third reading of this book and, while I thought Colin Firth was good, I’d recommend the Michael Kitchen version). This was a fun experience and I hope to participate again next year. I loved Beautiful Ruins. Ballerini’s performance was wonderful. Shocking, but I actually READ Beautiful Ruins (impulsive Kindle purchase) and loved it so so much. I did regret that I didn’t listen to it though, after hearing the rave reviews. I totally agree with your winner. I listened, and was blown away. I love Walter, and am convinced he has a golden pen. His writing always amazes me.